The other two are Peggy Leger and Jennifer Line. Leaders of the Macoun Field Club are volunteers from the Ottawa Field-Naturalists’ Club (OFNC). The OFNC also provides a meeting place (the Fletcher Wildlife Garden building), and funding. The leaders are members of the OFNC’s Macoun Club Committee, which reports both monthly and annually to the larger organization. The annual reports are published each year in the OFNC’s scientific journal, The Canadian Field-Naturalist. Rob Lee is the Chairman of the OFNC’s Macoun Club Committee. He is one of the primary contact people for the Macoun Club. 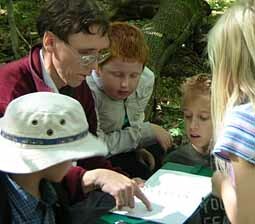 Since the mid-1980s, he has taken charge of hundreds of all-day field trips, and dozens of Macoun Club camping trips. Before that, Rob was a member himself from ages 9 to 18. In those days he was a rock collector and birdwatcher. He has been keeping field notes since he was 11 and is the main writer for the Macoun Club’s nature-journal about our study area (shown here being discussed in the field). He created most of the Club’s web pages.In the years between being a member and coming back as a leader, Rob studied wildlife biology at the University of Guelph and then began a series of solitary Arctic expeditions. Through all the years he continued to visit both the Macoun Club’s nature-study area in Ottawa’s western greenbelt and Gerry Lee’s lands in the Pakenham Hills. These remain the Macoun Club’s principal field-trip destinations, and have thus become home ground to generations of Macoun members.Rob has worked as a scientific editor and writer, and on his own studies a wide range of natural phenomena. In 2016, he was made an Honorary Member of the OFNC. Barbara Gaertner grew up on Long Island, N.Y., and so was compelled to grow up without the Macoun Club. When her two boys joined in the 1980s, she found herself envious of their experiences and sought a way to take part on her own account: she had to become a leader. There have been hundreds of meetings and field trips since then, and she hardly ever misses one. She plays a major role in Macoun Club camping trips, too. For years Barbara also served as the Macoun Club’s official representative on OFNC Council. Her parents fostered a strong feeling for the outdoors, and in Macoun Club she has taken advantage of every opportunity to develop a deep knowledge of natural history. She sets out to learn one thing after another, seeking out important books, collecting specimens, and taking part in every research opportunity that comes her way. She took the group’s idea of having a “study tree” very seriously, and has been keeping tabs on four of them for 25 years. Diane Kitching’s evolution as a Macoun Club leader parallels Barbara’s. Her two children — a boy and a girl — drew her into the activities, and soon she was “hooked.” She is in charge of almost every meeting and rarely misses a field trip. Most families find themselves talking with Diane regularly because she is the one they call to register for field trips; she has been doing this since 1996. 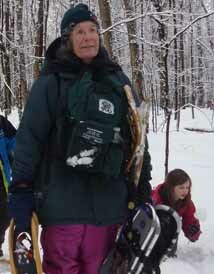 She is always there to help children who lag behind through sore feet or weariness; here she has been laden down with four pairs of snowshoes when the going in wet snow became too heavy. Diane has been the Macoun Club representative on OFNC council since 2005.Spending her childhood close to the wild places in Nova Scotia and P.E.I. made the great outdoors an important part of Diane’s life, including a lasting interest in mushrooms that her grandfather instilled in her. A passion for gardening and backyard birding that developed over seven years in England, has, through Macoun Club, become an interest in all plants and animals, and ecology generally. She took History and English at McGill University, and War Studies at London University.For their dedication to the Macoun Club Diane and Barbara were the joint recipients of the OFNC’s “George McGee Service Award” in 2011. (Rob says he remembers George from OFNC birding trips in the late 1960s). Annie Bélair has been one of our leaders for more than ten years. She comes from Kapuskasing in the boreal forest. Like Barbara, she studied French literature (at York University). Her awakening to the call of the natural world came literally at the break of day one special morning in Algonquin Park, when she stepped out of her tent, looked around, and thought “How wonderful it would be to have a job in a place like this!” To that end she entered a forestry/wildlife technician course at La Cité Collégiale in Ottawa. 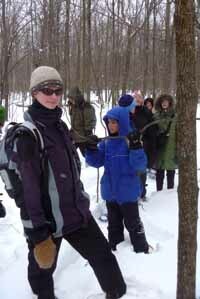 She has since been an interpreter for the National Capital Commission in Gatineau Park, worked for the Canadian Wildlife Service, and is again an interpreter, now at the Canadian Museum of Nature.One winter, Annie devoted a good deal of time to a repeat survey of Eastern Hemlock trees, in the Macoun Club study area. She found that the decline noted 25 years ago has accelerated. She appears here with a Macoun Club group in the study area.Annie acquired a lot of first-hand experience with invasive species as a volunteer with the Fletcher Wildlife Garden. 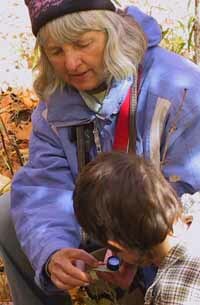 She has worked for the Canadian Wildlife Service and the Canadian Museum of Nature. She is also Editor of the OFNC’s quarterly publication, Trail & Landscape. All photos donated or provided by members and leaders, past and present. Updated June 17, 2016.